Bob and his band at the Clyde in Glasgow. This week I read that 81% of all statistics are made up, so last night I wrote an article tentatively titled An Alphabet Soup of Made Up Statistics. Not sure when I'll share it, but for now it's something I'll keep in my back pocket, Betty Davis style. This is a Dylan-themed post because we're one week out from Duluth's 2017 Dylan Fest celebration. Ezra Pound and T.S. Eliot have both notified us that they will be unable to attend, sending their condolences in a letter that we may or may not read during the Singer/Songwriter Contest on Friday evening, May 26 at the Clyde Iron Works here in Duluth. How interesting that Dylan himself just last week played at the Clyde... in Glasgow. 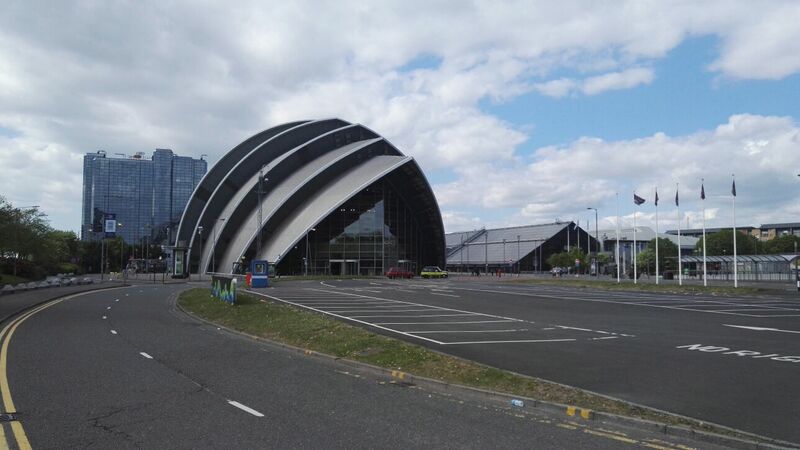 The Clyde Auditorium that is. You can read the reviews here at Bill Pagel's Boblinks site. The Clyde... Nicknamed the Armadillo by locals. In April Bob Dylan and His Band kicked off yet another European tour, which they completed this week in Dublin. The first stop was Stockholm where he answered the question "will he or won't he?" He did and it was done, what he needed to do and received his Nobel Prize. From there the tour skipped about through Scandinavia, then down to the Continent, making a series of stops throughout Northern Europe -- Denmark, Germany, the Netherlands, Luxembourg and Belgium before hopping over to the British Isles. Here are some stats from this spring fling across Europe: 22% of the those who attended have seen Dylan ten times or more. 13% of these have seen Dylan 100 times or more. 19% of those have seen Dylan 300 times or more. And a few of these have been here to the Northland for Duluth Dylan Fest. 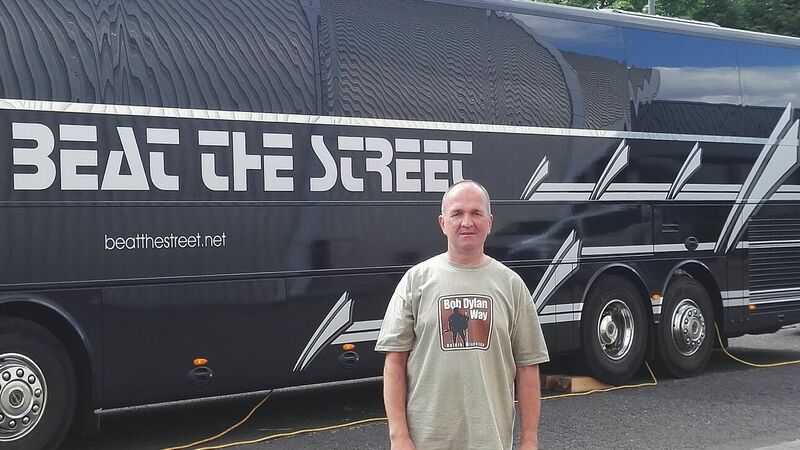 Bill M in his Bob Dylan Way T-Shirt by the NET Tour Bus. 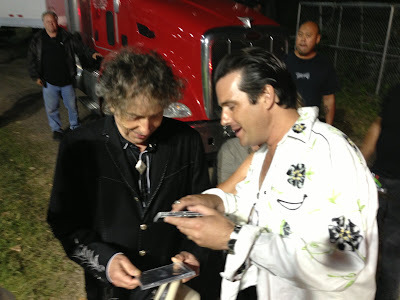 We have been a huge fan of Bob for many years and in fact met Bill Pagel in Duluth in 2015 at the Dylan Fest. It was an awesome trip. My first concert was in around 1985 in London. I have seen Bob 24 times, twice in the USA, Spain, Prague, Austria and throughout Britain. 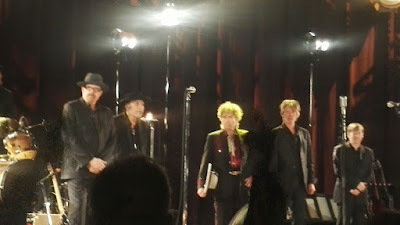 The Glasgow Concert, I have to say, we thoroughly enjoyed all of it but the Highway 61 arrangement was especially good. My favourite Bob song is Sylvio and I am particularly enjoying the Triplicate album at the moment. The venue is the first time we have attended a concert in that particular building and, yes, the acoustics were very good and the size was intimate. Glasgow has a few good venues that host many big stars of today. We live only a few miles from Glasgow city centre.,which took us only 30 minutes compared to November 2016 we flew to Clearwater, Florida and saw Bob's gig in the Ruth Eckert Hall. 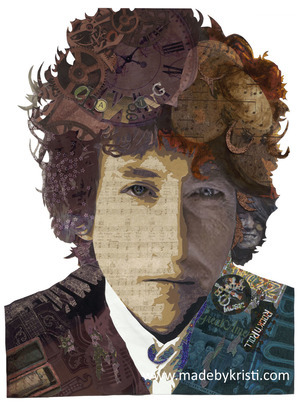 We also have a few of Bob's artworks from his Drawn Blank series, Brazil series and the newly released Beaten Path, so yes you could say we are huge fans. Earlier this week I finalized the Trivia Contest which will be held again at Carmody's, Sunday night heading into the week. I'd worked on it over the winter and must have done it while feeling mean-spirited because it was just a little too difficult for the average passer-by, which would not have been a disaster since everyone participating would surely learn something new, as in minutia that might have little relevance to anyone's quality of life. In fact, I didn't even know some of the answers myself, and I've read about 25 books about Dylan. At the urging of friends I revised the questions so nearly anyone can play and not feel ashamed. And, as always, there will likely be some lovely parting gifts. Looks like Robby and Bob are trading CDs. The official kick-off event is the concert at Karpeles Saturday, May 20: Robby Vee and His Rock 'N Roll Caravan, an Armory Arts & Music Center Benefit Concert. The acoustics are fabulous anywhere in the house. I considered buying two tickets so I could sit up front and sit in the balcony. Those balcony seats are stellar for sound. Purchase tickets here at Eventbrite. Of Robby's dad, whom young Robert Z performed with as Elston Gunnn, Dylan once said, "Vee had an edgy tone to his voice as musical as a silver bell." Robby sent word that, "We will be celebrating the earliest roots of Elston Gunnn aka Bob Dylan and my father's career, along with our good ol' foot stompin' style of rock n roll." For what it's worth, I hope we see you there. Special thanks to Bill and Barbara for the photos from Glasgow, and Robby Vee for the unposed snapshot at the end. Paris and France, you know? Yes, of course. Bob loves France and who doesn't love Paris? If I'm So Smart Why Ain't I Rich?